I really enjoyed this story about young widow Annabel’s quest to have a baby, some time after the death of her beloved husband Tom. Annabel feels her biological clock ticking but has no desire to replace Tom having promised to be faithful forever. During a chance meeting with the lovely Dan, and fuelled by alcohol, she asks him to be the father of her child. This is to be purely a practical arrangement, no strings, no further involvement from Dan. Dan seems to be a commitment-phobe having a seemingly endless string of girlfriends, none of whom last long. However, it is really Dan’s mother who is the problem. Over bearing and interfering and determined to see her only son settled, she scares most girls off! What I thought Suzie Tullett does very well in this book is to make you feel and understand her characters complex emotions. Annabel is still missing her husband and really looking for love but denies herself the opportunity. When she realises she rather likes Dan, she feels so guilty she refuses to accept the possible chance of happiness. Dan also develops feelings for Annabel but won’t admit it either. He is having a huge crisis in his life and I thought that this aspect of the story was dealt with very sensitively. The trouble with words is it’s not always easy to say what you really feel. I seem to have made this book sound like it’s a heavy going story of grief and love-denied but it’s not at all. It’s a charming love story with lots of funny moments such as the one involving Dan’s mum and a drug bust! In fact my opinion of Dan’s mum changed a lot throughout the book and I ended up really liking her. And as for the end of the book, well you may need a hankie or two! From the most unlikely situation, Suzie Tullett creates an ending that will have you smiling – and perhaps sniffing a little too! My thanks to Hanna Oliwa, publicist at Safkhet for giving me a copy of this book to review. 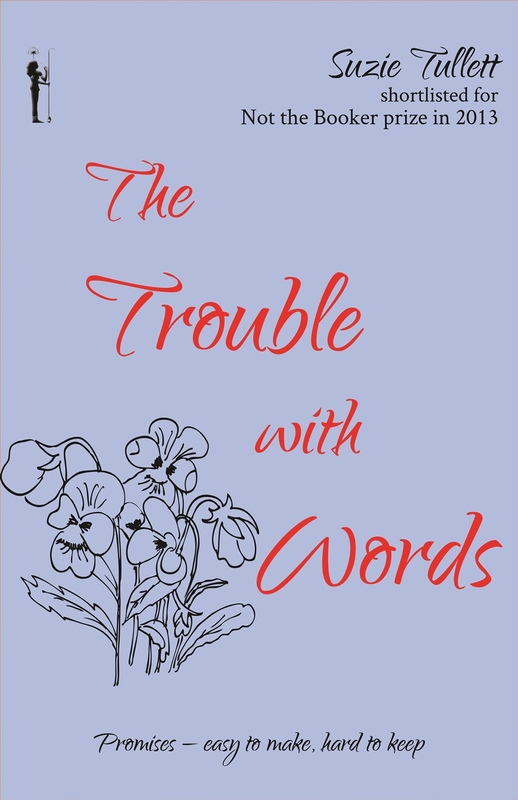 The Trouble with Words by Suzie Tullett was published by Safkhet Publishing on October 1st and is available on Amazon – buying links below. Having long made a promise to her husband, young widow Annabel has no intentions of breaking it. What she does plan to do, though, is have a baby. Not the easiest of tasks for a woman with a deceased other half, and having explored all her options, her only choice is to take the unconventional route. Setting out to find her own donor, Annabel meets Dan. Single, fun-loving and definitely not looking for commitment, this unruly blonde, blue-eyed man seems perfect for the job. Dan wants nothing more than to find his dream woman. But with a mother intent on sabotaging his every relationship, he can’t help but think he’s destined to remain single. Of course, he knows his mother doesn’t really want him all for herself, why else would she keep insisting he meet Maeve? Why else would she insist Dan promise to find himself a wife before she meets her maker? Forced to negotiate matters of love, life and death, Annabel and Dan seem the answer to each other’s prayers. But will they really be able to keep the promises they made? And is having a baby really the solution?